You can renew your loans by telephoning any library in North Lanarkshire, visiting any library in North Lanarkshire including our mobile libraries, emailing us at libraries@culturenl.co.uk or online provided another customer does not require them. eBooks can be renewed through the BorrowBox app. To renew other items online, please click here. You will need a password to do this. If you don’t have a password you will need to request one here. Any one item may be renewed up to 12 times. You will be advised of the new return date. Please make a note of the new due date on the item’s date label. 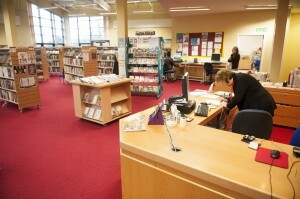 Payment is required on your next visit to the library in the case of telephone, e-mail and online renewal of overdue or any chargeable items such as DVDs. The payment due is automatically recorded on your membership at the time it is renewed. Extended loans are available to cover longer holidays.